D and I have been cooped up inside a lot. 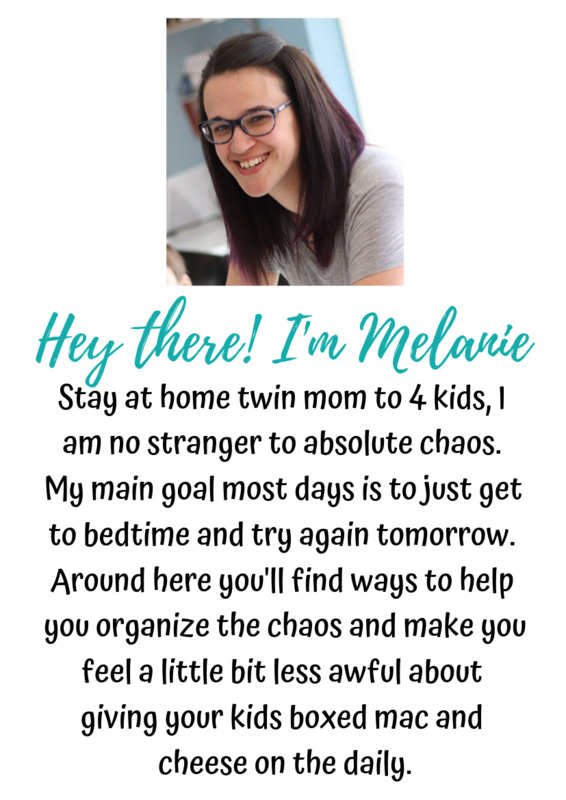 Normally, I don’t mind the heat, but I’m 7 months pregnant and cranky, so it is just beneficial to EVERYONE in the state of Illinois that I just keep to myself. Seriously. I notice if we sit in front of the TV for too long D gets crazy. He’ll just randomly start running across the couch and run over to “pet” (READ: smother) the dog or cat (or me). So I wanted to try some sensory activities. I have always loved the sensory play approach, especially for boys. I feel like he needs that sensory output every once in a while. We were at Michael’s the other day and he looked over and saw my least favorite children’s toy ever – Play-dough. I don’t like using the word hate, but I HATE play-dough. I have been able to avoid it in our 2 months home. But he saw it and asked if we could buy it. I told him no, but that we could make it at home because I wasn’t going to spend money on something that I can just make at home. I thought maybe he would forget. No such luck. We got home and it was the first thing he asked to do. I told him he had to wait until after nap and that he had to actually take a nap first. He hardly ever naps. Well, that little booger took about a 1.5 hour nap. And what do you think his first words were when he woke up? 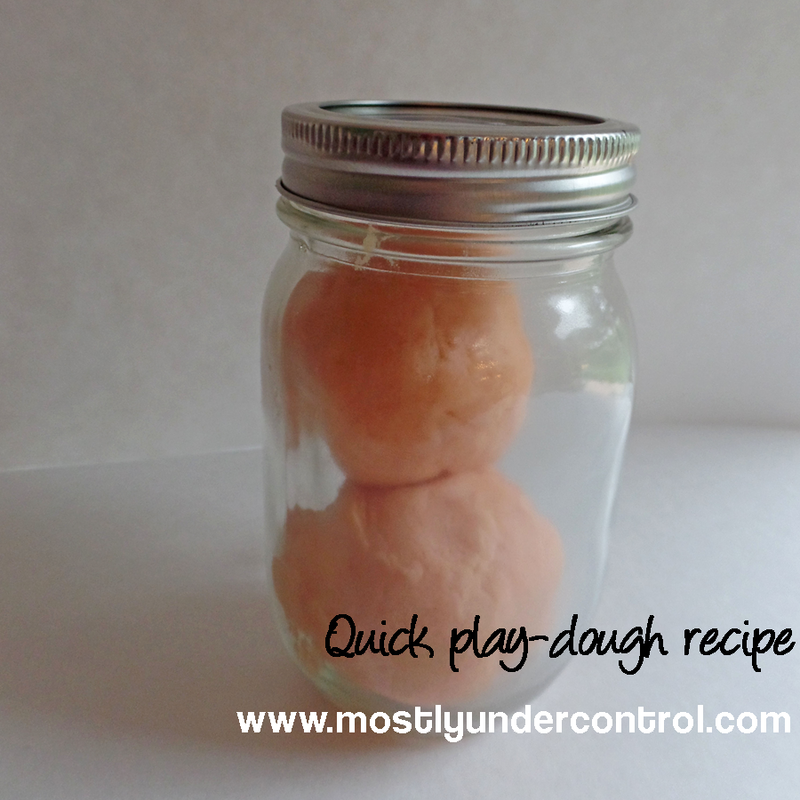 “Mommy, did you make my play-dough without me? !” Of course not, dear. I wouldn’t dare. I was closing out a Thirty-One party, so the play-dough had to wait. Daddy got home from work, so we had to eat dinner. He was so patient. After his nightly walk with Daddy and Shadow, he asked about it as soon as he got home. I just couldn’t say no. 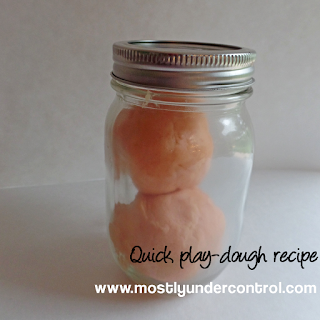 I had play-dough recipes memorized so this wasn’t difficult. I didn’t have a chance to snap a picture of my whole set up because he was anxious. This is a no-cook recipe which is the best. 1. Mix together all the dry ingredients in a bowl. 2. Create a well in the center of the dry ingredients. 3. Add the food coloring to the boiling water. 4. Add the oil and water to the well and mix. Keep it stored in an airtight container. I am not sure how long it will last you – it all depends on how often you play with it. I have a giant bucket of 100 cookie cutters that he uses to play with it. I am not sure why I thought I needed all these cookie cutters, seeing as how I strongly dislike baking. I am terrible at it.